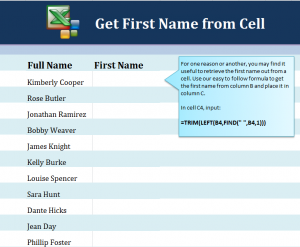 Learn how to get first name in Excel spreadsheets from a full name. When importing data into an Excel spreadsheet, you may want to split up the first and last names of the data. This can make it easier to organize, alphabetize, and sort through lists of employees, contacts, or other groups. The formula to apply to achieve this is simple. Download the example spreadsheet and practice this formula. Hit enter, and the cell C4 should now contain just the name “Kimberly”. Instead of entering this formula over and over, you can grab the corner of cell C4 and drag it down the C column to C14. This will fill in the column with their first name counterparts. If you want to use this formula in your own spreadsheet for contacts, employees, or others, then all you need to do is change the “B4” in the formula to the cell with the full name you want to retrieve information from. To learn more Excel tips, formulas, tools, visit our Excel Guides section.